The long-awaited foldable Infinity Flex Display wasn't the only thing revealed at the Samsung Developers Conference in San Francisco today. The South Korean electronics giant also announced a major overhaul to the company's Android interface, simply dubbed One UI. Samsung's new mobile UX is said to be "more natural and comfortable for one-handed use," particularly for larger handsets like the Galaxy Note 9. Effectively splitting the display into two halves, Samsung's One UI places interactive controls in the bottom half of the screen so that they're closer to your thumb, with a viewing area at the top that shows either a search box or large header text. As an example, Samsung showed off its new and improved Clock app, which now places alarm toggles at the bottom of the screen, and big, easy-to-read text at the top which displays how much time you have before your next alarm goes off. One UI will also bring a system-wide night mode option, as well as reorganized and regrouped options in the Settings app. 'Focus Blocks' have also been implemented, which are large, clean interactive icons that allow users to "see more with every tap". In the Gallery app, these take the form of Albums with much bigger thumbnails. 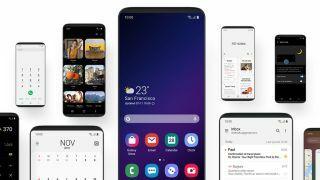 According to Samsung, the company's previous UI was "reengineered to reduce clutter and distractions, allowing the user to better focus and quickly navigate their phone". As you might expect, this 'two halves' approach also makes Samsung's One UI ideal for foldable smartphones. Samsung's Android 9-based One UI beta will be available from this month (November) in the US, Germany, and Korea, with more countries in Asia and Europe following shortly after. For everyone else, an official rollout of One UI will arrive in January 2019. You can find out more about the new interface, including how to become a beta tester, at Samsung's dedicated One UI webpage.